To keep our site as neat and tidy as Switzerland itself, we have changed this page into an index of Switzerland and Swiss coins, and split its previous contents into the three following pages. Very brief notes about Switzerland and Swiss coins. 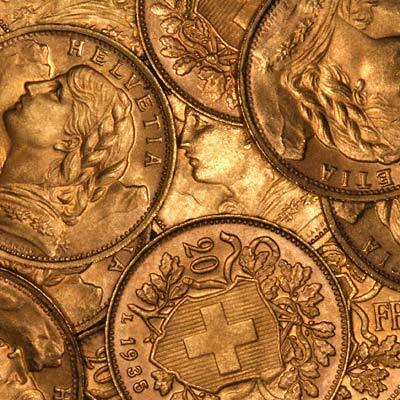 The only Swiss gold coins issued in large quantities and commonly available as bullion coins are the 20 Francs. As with most countries, these smaller coins were never issued in the same quantities as the main ones. For silver and base metal coins of Switzerland, please look at our original Chard Coins website. In Switzerland, a 'Healthy Currency' campaign is advocating a gold franc as a parallel currency to the official Swiss franc. 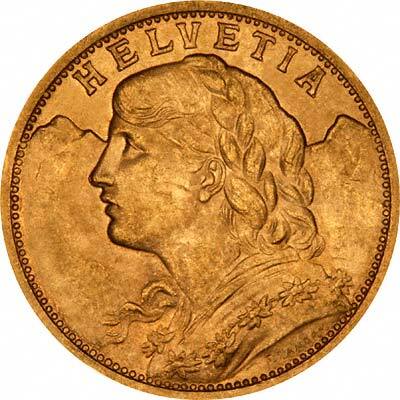 The Swiss Parliament is to discuss the proposed introduction of a new gold franc currency, and presumably new gold coins.